Aroideana is an illustrated annual devoted to information about the family Araceae and published by the International Aroid Society, Inc.
Aroideana is available as a benefit of membership in the International Aroid Society. Back issues of Aroideana are also available. For more information, please click here. The IAS Newsletter is a quarterly publication of the International Aroid Society with short pieces relating to aroid cultivation and research, as well as society news. The IAS Newsletter is available as a benefit of membership in the International Aroid Society. Back issues of the newsletter are also available online to members only. This new book, published in 2017, is distributed from the USA by the International Aroid Society. 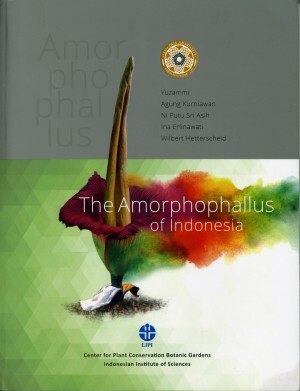 Completely illustrated in color, the 176 page book is available in soft cover only and is the first comprehensive reference source for the Amorphophallus in Indonesia. In addition to a complete description of the genus in Indonesia, the work contains sections on collection, cultivation and propagation with each species lavishly illustrated in color photographs and detailed distribution maps. This new publication, in French, is devoted to the Araceae of French Guiana, where the family is largely represented by 21 genera and 122 species, of which a large number of samples have been deposited at the Guiana Herbarium. Several chapters cover Araceae biology and ecology: growth patterns, floral morphology, thermogenesis, pollination and relationships with non-pollinating animals. Ethnobotanical usages are described in a separate chapter. The last section, devoted to systematics, provides identification keys for the genera and species found in Guiana, as well as a brief description of each species. Lavishly illustrated in full color, this book may be purchased from the publisher here. This new book, published in September 2011, is distributed in the USA by the International Aroid Society. Completely illustrated in color, the 146 page book is available in either hard cover or soft cover and is sure to be the definitive work on Peninsular Malay Araceae for years to come. Containing Araceae and Acoraceae. Published 2012, and contrary to the publisher's website, measured at 414 pages, including 89 color plates. This book is avaliable at a cost of $140, shipped airmail, from the publisher here by contacting the persons at the bottom of the page. A small number of books will be imported by the IAS for sale within the USA. Please contact Albert Huntington if you are interested. Originally published in 1988 as the first truly comprehensive review of one of the largest and most popular plant families, Aroids: Plants of the Arum Family was enthusiastically welcomed by botanists and horticulturists alike for its attention to scientific detail and delightful writing style. Now in this completely updated second edition, we learn of discoveries made in the last decade as the family has grown from about 2500 species to nearer 3200. For more details, please click here. The Amorphophallus titanum has made headlines in North America since the first flowering in 1937 at The New York Botanical Garden. "Tales of Titans" CD-ROM traces the titan arum from its discovery in the jungles of Sumatra to the thirteen bloomings in North America. This history comes to life with stories, photographs, and video, including amazing time lapse sequences. For more details, please click here. "This personal notebook on Aglaonemas has been a fun project and is being shared in the hope that it will help other Aglaonema growers to identify their plants. Maybe it will encourage others to increase their collections when they see the choices now available. Maybe, too, it will encourage growers to try new cultivars augmenting the 10 or 12 plants that are so common..."
This Adobe Portable Document File edition is being made available to IAS Members as a benefit of membership. The history of systematic work with Araceae has been previously covered by Nicolson (1987b), and was the subject of a chapter in the Genera of Araceae by Mayo, Bogner & Boyce (1997) and in Curtis's Botanical Magazine new series (Mayo et al., 1995). In addition to covering many of the principal players in the field of aroid research, Nicolson's paper dealt with the evolution of family concepts and gave a comparison of the then current modern systems of classification. The papers by Mayo, Bogner and Boyce were more comprehensive in scope than that of Nicolson but still did not cover in great detail many of the participants in Araceae research. In contrast, this paper will cover all systematic and floristic work that deals with Araceae which is known to me... For the complete article, please click here. This book is the first complete taxonomic treatment in English of the Araceae, a large plant family of 105 genera and over 3,300 species. 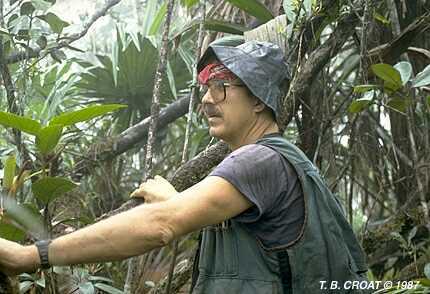 The aroids are very diverse in the humid tropics and include many of the world's most popular ornamental plants. Every genus is described and illustrated with one or more plates of original line drawings by the renowned botanical artist Eleanor Catherine, as well as range maps and 94 colour photos. There are general chapters on many topics, including economic botany, phylogenetic relationships, fossils, cultivation and detailed reviews of anatomy (by J. C. French) and chemistry (by R. Hegnauer). xii + 370pp. 296 x 213mm. Hard cover ISBN 1 900347 22 9. The Genera of Araceae is currently out of print, though a new edition is being contemplated. The genus Arum consists of 25 species of tuberous plants. Many "bulb" and alpine enthusiasts grow a couple of species of Arum, usually the showy A. creticum and A. dioscoridis; and the widespread A. maculatum is well known. There are, however, many species which are practically unknown except to a few enthusiasts, and it is one of the aims of this book to bring these attractive and interesting species to the attention of a wider audience. Building on recent cultivation, pollen, cytology and chemistry research, this reference work should increase understanding of this genus. Hardback | 176 pages | The Stationery Office Books | 1993 ISBN 0112500854. This work is currently out of print.